Among many headlamps the Zipka+ is probably one of the few that can be carried with your edc kit. The simple explanation for this is that the zipka is the only headlamp without bands it has a retractable kevlar cord instead so when the cable is retracted the headlamp takes almost no space from your kit. The Zipka+ has 4 leds powered by 3 AAA batteries, it has 3 brightness modes and one blinking mode, you switch modes pressing the only button it has, starting in the brightest setting. Runtime goes from 100 hours in maximum brightness to 150 hours in the lowest setting. The retractable kevlar cable is useful to attach the Zipka not only to your head but to other objects such as backpacks, poles, tents etc. Just make sure your hair is not in the middle when the cable retracts ;-). 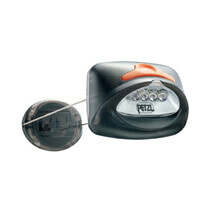 This little useful headlamp costs about $35 and you can read more information in Petzl's website. This is a 7 in 1 survival tool by Sun Company. Tool #1 is a whistle, the pealess design is fine for bad weather and can be used in rain conditions, the whistle is quite loud, not as loud as a Fox40 but requires less force to be blown so it's good for children, elderly or people that have suffered an accident and need to call attention. Certainly good enough to call for help in case of need. Tool #2 is a thermometer with both Celsius and Farenheit scales, it works fine. On the side of the tool opposite the thermometer you can also find tool #3 a spark striker, just strike it with a metallic object to produce sparks, this doesn't work nearly as well as a specialized fire starting device but it is quite acceptable in emergencies but I wouldn't recommend it as your primary fire starting device. 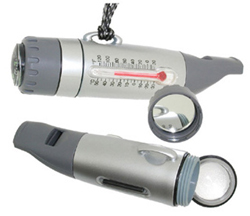 The external cap features tools #4 and #5, a compass and a signaling mirror. The liquid-filled compass works fine and has luminous material so it can be read in the dark after exposure to daylight, the signaling mirror is very small and doesn't have a hole in the middle to aim so it is probably barely usable for serious siganling purposes. Behind the first cap there is a second cap with tool #6 a 3x maginifier that can be used to start a fire using sunlight, it works very well. Between the compass cap and the magnifier cap you can store a small pill or tablet, either medicine or something else like a water purifying tablet, it is a nice thing to have this mini compartment available. The last tool is the storage chamber itself, a sealed compartment protected by o-rings where you can store different items, compared to other survival capsules this one is slightly wider and that is a bless to store several items that are very hard to store in smaller capsules. On the side there is a plastic attachment point for a lanyard, a small piece of cord is supplied with the tool. The plastic construction is not as solid as aluminium but is light and the plastic is strong enough to resist impacts and daily usage. The different tools work well and the storage chamber is particularly good, considering you already have a compass, whistle, magnifier and fire starter you can put several things in the chamber and have quite a complete survival kit packed in a small useful tool. You can read more from Sun's Company website and you can order for $6.99 from EDCDepot. This is a multiple-use item. They are basically end caps for Maglite or Streamlight D cell flashlights, you can just unscrew your D-Maglite end cap and screw in this cap to have a luminous end in your flashlight. They use four C2032 coin cell batteries so no power will be drained from the flashlight, spring is not provided so you need to use the spring from your flashlight. The second way to use this caps is to attach it using a magnet base (included) to any metallic object. Installing some color lights on the roof of your car can be illegal so check your local regulations, yellow is usually legal in most countries. 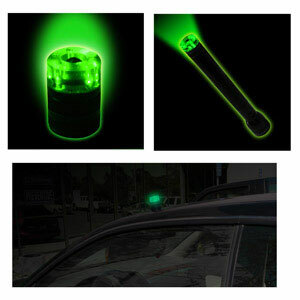 The caps provide both light to the front and in 360 degrees using several LEDs strategically distributed in the body of the light so they can be used as a flashlight or as an ambient light as well. The magnet has a hole for a standard tripod hole so the third way to use it is to attach the light to a tripod and use it either as a marker or to provide light in a room. Some retailers claim these caps to be produced by the same company that produces gloo-toobs but I couldn't find any information in the Gloo Toob official site so I'm not sure about the source. The caps have two modes: constant on and beacon they are activated and changed using a rubber clickie switch in the middle of the cap. If you want one for your car, one for your flashlight and one for your tripod you will have to buy 3 :-). They are available in amber, blue, red, green and white at $32. You can get them from lighthound. Rick Hinderer is a very well known artist that makes beautiful knives and other objects. One of his greatest products is the modular kubaton, made of Titanium the kubaton is basically a hollow body where you can attach different end caps. One of the end caps that can be added is a pen cap, this makes the kubaton an everyday Titanium pen. The pen accesory uses a fisher space pen universal refill (not the ones for bullet pens) and comes with a threaded cap and a threaded end to screw the cap when you are using the pen. There are two ways to purchase this; one is to buy the body ($40), and then the pen accesory ($175) for a total of $215 or you can buy a deluxe set for $295 that will include a pocket clip, the body, the pen and two optional end caps from your choice inside a pelican 1010 case. 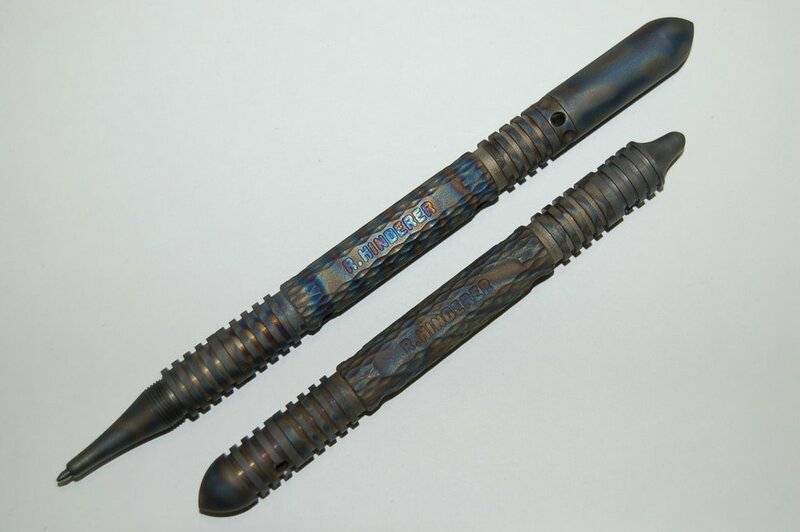 This can appear to be expensive but is the price to pay to get a top quality custom made titanium pen that can also be used as a kubaton and that is modular and can be combined with different ends and accesories. Rick makes this kubatons and pens in different finishes, the one in the picture is the "strider" finish but there are more. To purchase or browse different models you can visit Rick Hinderer's website. Multi-tools shaped like a credit card are good to carry inside wallets, pockets and pouches. This card has a small blade, scissors, a ballpoint pen, a pin, tweezers, a red led light, magnifying glass, a small ruler and 4 different screwdrivers. The scissors are very good and the flat mini screwdriver with 4 different ends is great and has good torque for such a small size. The blade is soft and should not be used for intensive jobs. In my opinion this tool is only missing a toothpick to have a very complete set of tools, you can replace the tweezers for a toothpick if you want buying a Victorinoz toothpick replacement. An excellent set of tools in a very small package. 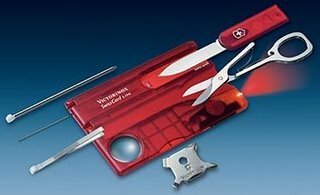 The swiss card lite retails for about $20, you can find more information in Victorinox's web site. 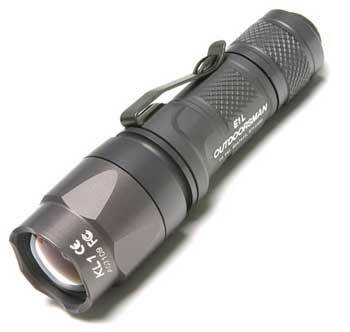 This little flashlight is a great EDC light, it is a luxeon 3watt LED light powered by a single 123A lithium battery. The output is about 30 lumen and the runtime is 4 hours. The switch is a tailcap clickie switch. The light is part of the Surefire E-series that offers body, switch and head compatibility, so here you get a Z57 tailcap switch, an E-Series 1 cell body and a KL1 head. Buying an E-series 2 cell body you automatically have an E2L flashlight and there are many many possible configurations. The KL1 head uses a special TIR optics system to narrowly focus the beam, at short distance the beam projection is actually a square!. This kind of beam throws for long distances with just a little spill on the sides so while small you can light up objects that are far away. The KL1 accepts rechargeable batteries without any dangers, you can use a R123 battery and the light will be slightly brighter. Being a Surefire the finish is excellent in HA-III aluminium, very resistant to scratches and impacts, it is also waterproof with o-rings to seal the light properly. This little marvel retails for about $100, you can find more information from Surefire Official website and one good dealer to get it is OpticsHQ. The charge Ti is one of the most complete multi-tools from Leatherman. It is made of stainless steel with Titanium handles and bronze bushings. LM also offers an XTi version that is identical but has a second large bit driver and no scissors so choose the one that is better for your needs. 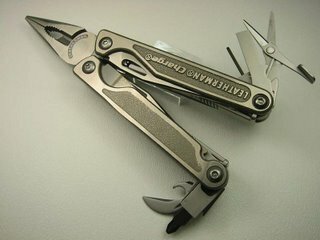 The Leatherman Wave has the same tools but is not made with Titanium, the charge can be seen as a better built and more expensive wave. Without being fully opened the Charge offers quick access to a 154cm steel point blade, serrated blade, saw and wood/metal file (diamond coated on one side). Opening the tool you get access to the pliers and wire cutters. The pliers end in a narrow way so can be also used as needle nose pliers. Then you have a plain edge screwdriver, scissors, small bit driver, large bit driver, can opener, bottle opener and wire stripper. The tool includes 8 bits for the large bit driver, a pocket clip and a quick release ring. The pocket clip and quick release ring are mutually exclusive, you have to choose one or the other or none of them but you can't use both. Every single tool in the Charge locks that adds a lot of security to the tools, unlocking is easy and can't be done accidentally. A nylon or leather sheath is include to carry the tool and the bit drivers. The sheath is particularly excellent, you can carry the tool, the bit drivers and there will be some extra space for a small pen or flashligh on the side, it is a very nice sheath and very functional. The only drawback in my opinion of this fantastic multi-tool is that the scissors are not ready to use without opening the tool and furthermore the way the scissors are deployed is not fast enough for inmediate use. Since scissors are one of the things you may need very frequently I would have preferred a quicker access to them on the plus side they cut great all sort of materials. As an additional accesory you can buy a bit kit including a set of 21 double ended bits for the large driver and one for the small bit driver. Being constructed with Titanium Handles the charge is not a heavy tool yet fully packed of excellent tools that can be professionally used. It is certainly the best multi tool that Leatherman offers and a fantastic help for all kind of users. The retail price is about $100 and you can read more in the Charge Official Website. This tool has the size of a normal key so you can put it on your keychain and it will be very hard to distinguish from a normal key. The utilikey can be opened, removed from the keychain and used as a tool, it offers a blade with plain and serrated edge, a phillips screwdriver, a bottle opener, and a small flat screwdriver useful for glasses. The blade is small but surprisingly sharp. The screwdrivers work well, maybe the small one is too fat. The bottle opener is fine, does the job. The best about this tool is the ability to go absolutely unnoticed with your keys ready to be used if needed. Two small problems are that sometimes the tool can open accidentally and might fall from your keychain, so you may want to secure it better; a piece of shrinking tube can help. The other problem is that not having a handle makes the tool not so confortable to use, I tend to grab it from the blade and that is not a very good idea if you need to hold it firmly. The price is about $12, you can get it from several stores and read more information in Swisstech's website.